Future Market Insights has announced the addition of the “India to Lead the Global Adsorbents Market with the Highest Growth Rate in the Foreseeable Future" report to their offering. Valley Cottage, United States - March 25, 2019 /MarketersMedia/ — Adsorption is a process of accumulating molecules, ions, or chemical species from solids and fluids onto a surface. The surfaces at which these molecules are bonded are called adsorbents. The process is used in several applications such as refineries, water purification, food processing etc. It includes different products such as activated alumina, activated clay, activated carbon, molecular sieves, zeolites and silica gel. A new research report by Future Market Insights titled ‘Adsorbents Market: Global Industry Analysis 2012-2016 and Opportunity Assessment 2017-2027’ successfully exhibits the complete scenario of the global and an individual analysis of the various regional segments of the adsorbents market. 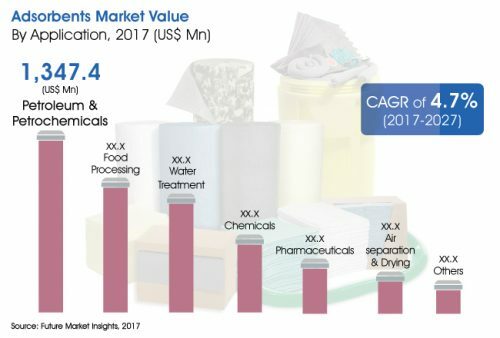 According to the analysis, the global adsorbents market has recorded a market valuation of over US$ 4,100 Mn in 2017, which is expected to reach a value of US$ 6,600 Mn by the end of 2027. Looking at the market growth, many manufacturers in the industry are expected to stay more inclined towards offering new products that have a better quality, to compete more efficiently in the global market. Increase in demand for petroleum refining in several regions has proved to be a major driver of revenue growth in the global adsorbents market. This is also accompanied by factors like the rapid growth of several industries including pharmaceuticals. However, high prices of some absorbents may take a toll on the global adsorbents market. The analysis also depicts that the highest demand for adsorbents is anticipated from the Indian market. The growing population and urbanisation in India is putting a pressure on refineries to produce more refined products. This is leading to the expansion of refining capacities, thereby contributing to the growth of the adsorbents market. However, the Indian market may also find a restriction in the growth of adsorbents in the coming years due to the availability of substitutes in the adsorbents industry. Among the product types, the molecular sieve segment is expected to dominate the global adsorbents market in terms of revenue during the forecast period. This can be attributed to the application of molecular sieves in various end-use industries. By application, the petroleum and petrochemicals segment leads with the maximum projected market value. However, the food processing segment is expected to grow at the fastest rate during the forecast period. By region, India’s adsorbents market is expected to grow at the fastest rate of 7.0% during the forecast period. Asia Pacific is projected to hold the maximum market value of over US$ 1,700 Mn by the end of 2027. The research report includes a major section dedicated to the competitive analysis of the market. It consists of a brief profile on all the major players in the industry which depicts their current as well as future market strategies. Some of these market players mentioned in the report are BASF SE, Sorbead India, Adsorbents Carbons, Universal Carbons, Global Absorbents Pvt. Ltd., Arkema Group, W. R. Grace & Co.-Conn. and Axens S.A.